One of the best things about being a journalist is getting to ask questions. Stephen Dubner has been doing this for years, accumulating fascinating bits of knowledge, hidden insights, and wild stories. By now he knows at least a little bit about a lot of things. Dubner has a friend who’s equally curious and who has also absorbed an enormous amount of information over the course of his eclectic career. James Altucher is an entrepreneur, investor and author. James also interviews people who intrigue him, for his James Altucher Show podcast. 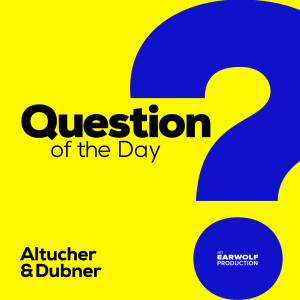 Not long ago, Dubner and Altucher started a podcast together called Question of the Day. It’s a continuation of the kind of fast-paced conversation these two smart, unconventional thinkers have been having for years over their long friendship and their long-running game of backgammon. It’s a safe bet that in no other podcast will you hear references to the business savvy of YouTube make-up artist sensation Michelle Phan, the improbable story of how a podcasting start-up called Odeo morphed into Twitter, and the writing habits of Stephen King. We like to say that QOD is for people who are long on curiosity and short on time. We’re guessing anyone who’s a fan of Freakonomics would fit into that category. So check out Question of the Day. You can subscribe to it on iTunes and also hear it on Earwolf, Soundcloud and Stitcher. And you can follow QOD on Twitter and Facebook. Your writings influenced me to make holiday gifts of your latest book - How to Think Like a Freak. A book of our times which reinforces my thought processes and states "most obvious/logical" conversations. Thank you. Get my vote for best book! Just a question? Do either of you gentleman aspire to run for office in the near term? The value of Zero. I think you need to dive into that one with Dan Ariely. Is free worth it? Well your podcast is worth it (although) I have donated money. Sometimes free is worth it if it does not take too much of my time. I got enticed into doing a survey for a free set of candles (I know, candles - WTW??) the survey took way too long, but it kept saying "almost done" so I kept going feeling like the end was one more short block. Turns out it was 5 longs blocks. In this case the candles were NOT free because my time paid for them 3 times over. Now my e-mail is on 50 lists, so that too will consume my time to unsubscribe. Here's a question to answer: When will Major League Baseball home plate umpires be replaced by cameras to detect balls and strikes? Today's telecasts of baseball games show the location of the ball as it crosses home plate, within an image of a rectangle denoting the strike zone. Whether a pitch is a ball or a strike can be instantly determined by these systems. With so much money and prestige at stake with these games, why not eliminate the cost of human error by an umpire? Couldn't agree more. MLB umpires are probably the best in the world, and they are only expected by MLB to be right about 85% of the time. The umps and MLB use a system similar to the 'pitchtrax' box we see on TV to evaluate and educate umpires. 85% accurate and at least half of those are no brainer calls well outside or right sown the middle. Let's leave an umpire behind the plate (for old time sake) but he will have an earpiece which transmits a sweet tone for a ball or a buzzer for a strike. Then catchers can just catch the pitches without having to try frame them in an attempt to deceive the ump into making an erroneous call. Sorry, but I've been chewing on this for a long time. Anyway, I've been a long time lover of Freakonomics, so finding QOD with it's mixture of witty banter and discussions keep my very long commute's happier than they would normally be. Anyway to the point your Podcast on inventions, there I was muttering to my phone right until the end where for about 15 seconds I thought yes you've got it, (imagine an angrier more agitated Professor Higgins from My Fair Lady), the invention that would change 1 billion lives. Teleportation hooray, just you missed one little, but very important fact. a Teleportation device that just teleports one very simple molecule, water. Imagine, "The Sahara", "The Namib" and Gobi Deserts growing food, lets not stop there, Ethiopia, Somalia, India all of central Australia; now let's take those flood prone places Bangladesh, California or even the the water melting from the Artic or Antartic now move that water to where it's needed, the list goes on. I'm starting to think this invention won't just change 1 billion lives but maybe change everyone's. Now if you could do two podcasts a day, my commute would be so much better. You asked what are we trying to get better at and how we can lessen the 10,000 hours required. I'm trying to be a better quick sketch artist specifically portraits. Hi Ralf, you should be able to download the podcast .mp3 file directly from the soundcloud page (https://soundcloud.com/question-of-the-day). Under the track there are the options to like, repost, add to playlist, share and download. Click the download button and soundcloud will ask you where you would like to save the file on your computer. I am a fan of the QOD podcast; this is why I feel obligated to give you feedback on 3 person co-hosting experiment. Ditch Manoush. Why? Her voice just doesn't fit in with what used to be easy conversation to the ear. Now it sounds a little cramped and she sounds a little whiney and annoying. I know how this probably sounds like hatemail or even trolling, but I'm not like that. I promise you I'm just giving you feedback of the silent majority. Yeah. I loved Question of the Day ! Followed the show since day one. Laughed out loud sometimes. Recommended it to others. But recently? All the Quora questions? What's with that gang ? A third person to follow? Come on! You are all intelligent people. But this podcast has become a jabbering cacophony. Impossible to follow. Questions that have become lowest common denominator. Ooo and while I am at it, the theme music grates! I'm turning off my subscription to this podcast. My ears are still ringing as I write this ! Sorry but you have lost me! -p, a curious person, a Freakonomics book reader and fan AND a Dubner and Altucher fan. I heard you sing the alphabet backwards and then get tripped up at the end at "Now I know my ZYXes..." I sing this in my preschool class and we end it with "Now I know my ZYXes, Next time wi might sing in Texas." It gets a good laugh. In case you were wondering, you can actually sing the Alphabet Song to the traditional tune starting at any letter and it works. We do this in preschool, too, in order for them to break up the monotony and learn the letters in a different way. It shakes up their little preschool brains and helps to make the letters more discrete. Very entertaining and informative. Thanks Stephen and James for all the time and effort you put into making this FREE podcast for me to consume. The new format - kudos on the concept of a third party presence to somewhat redirect rambling conversations which can be entertaining but is all too common to the series. It is an inspiration to shun the podcast that a militant market-skeptic has been shoe-horned into the show. Almost everything she says scans as doctrinaire nonsense - a throwback to Marxist political officers influence on various civic procedures. - "man-splaining;" what is this and why does it have any relevance on the show? If Ms Zomorodi is ignorant, let her do her research or shut up and learn something from a certified, recognized authorities on market activities. Why, why,why an gad-fly, ignorant hipster on this show? Net-net: May the listeners be treated to a less grating, more rational, guest of the show? Otherwise, keep up the great series. Dubner did a superb job of gently introducing Ms Zomorodi to the limits and rewards of a market. Well done.